Happy Monday! In case you missed it, OSU beat UT this weekend! That's means we're still undefeated!! In other news, today is the day Anna and I share our photos for the crazyjoy challenge word. Anna announced on Friday that our new word is SWEET. The special, sweet moment of daddy holding his daughter's hand. Saturday morning we headed over to Claremore to check out the wildlife conservation and enjoy the beautiful weather. We saw a ton of deer and walked all over the trails. Before Sweet P, the husband and I would go on these little outdoor adventures and talk, walk, enjoy a picnic lunch and just hang out together. We really enjoy each others company and being outside but it is crazy how much better these adventures are with a little one. Watching her take everything in and be in awe of deer walking by us just makes me stop and really appreciate my life. 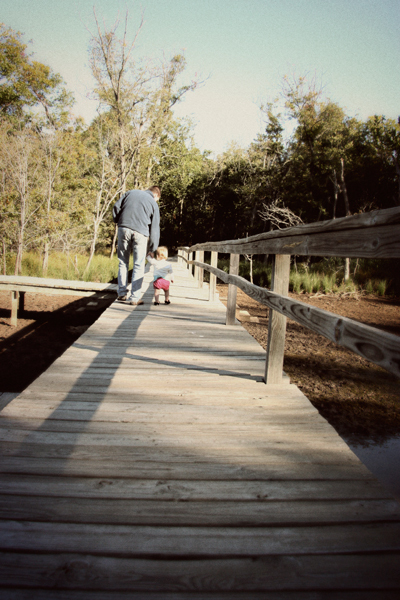 When Sweet P is older, I'll probably still think back to these sweet moments we got to have with her and remember her daddy bending down to hold her little hand as they walk along sharing life. Check out Anna's blog today to see her photo and to join in the challenge.